Thula Mama groups are designed specifically to nourish the needs of mums as well as their babies, and mums-to-be are included in this. Thula Mama is named after a traditional South African lullaby which translates as ‘Hush, Be Quiet, Don’t Cry’. Groups have been running successfully since 2002, having been started in Totnes by Helen Yeomans, a Devon-based singer/songwriter. Helen was interviewed about Thula Mama on the Chris Evans Breakfast Show on Radio 2 in 2007, and Thula Mama has also featured in The Green Parent magazine. Far from traditional singing groups where children get together and sing, at Thula Mama it is the mums who sing to soothe their babies who are aged from newborn to the pre-crawling stage, and some who have yet to be born. Chosen from around the world, mums learn lullabies and nursery songs, as well as simple favourites that have stood the test of time such as soothing Taize chants, uplifting gospel songs, blues and folk all in beautiful acappella harmony. 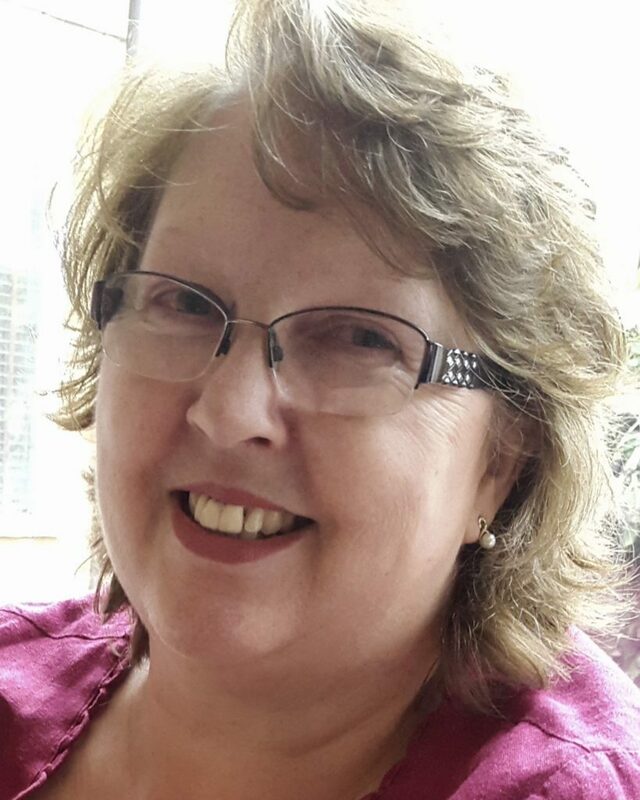 Sue Williams is an experienced mother of four, singer and trained Natural Voice Practitioner who has already (over 4 years ago) set up and still runs the weekly Gillingham Community Choir every Thursday evening. With her own children all now adults, and having a passion for helping others to discover the benefits of singing, she has been exploring how to introduce this wonderful, ancient form of communication to mums-to-be and mums with new babies to aide their natural bond-building. Groups have been running successfully since 2002, having been started in Totnes by Helen Yeomans, a Devon-based singer/songwriter. Helen was interviewed about Thula Mama on the Chris Evans Breakfast Show on Radio 2 in 2007, and Thula Mama has also featured in The Green Parent magazine. Far from traditional singing groups where children get together and sing, at Thula Mama it is the mums who sing to soothe their babies who are aged from newborn to the pre-crawling stage, and some who have yet to be born. Chosen from around the world, mums learn lullabies and nursery songs, as well as simple favourites that have stood the test of time such as soothing Taize chants, uplifting gospel songs, blues and folk all in beautiful acappella harmony. More than this, you will meet others in a similar position and have a chance to get to know each other while I make you a cup of whatever you fancy to relax with before we start singing. The benefits of singing have been well-publicised in recent years, and singing to your baby is the most natural thing in the world that is often overlooked. Not only will the sound of your voice help to soothe your baby and build an even stronger bond, singing with others will help you relax and unwind and leave the session feeling ready to face the rest of the day. There are CDs available to buy of all the songs (at reduced cost compared to the website) - some mothers have said that these are the only thing that get their baby to sleep. 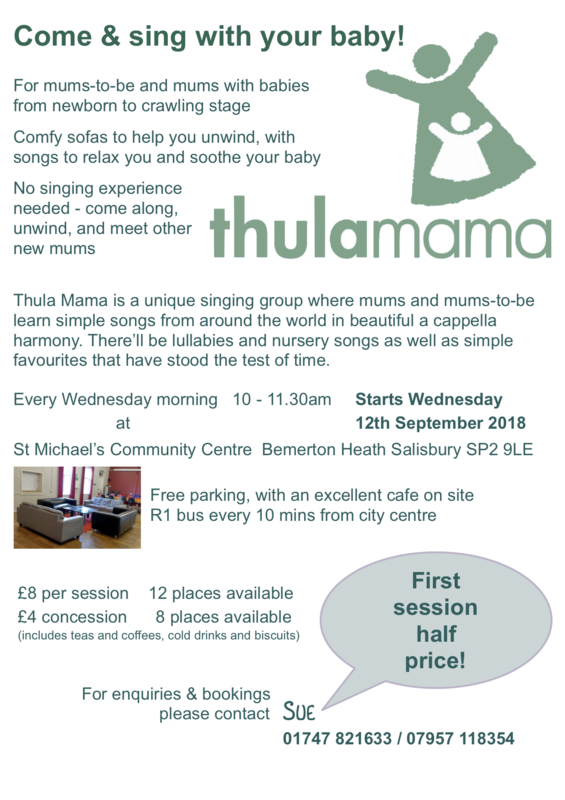 Sue is excited to be bringing Thula Mama to Salisbury, and will be facilitating weekly sessions at St Michael’s Community Centre, Bemerton Heath every Wednesday morning starting on 12th September 2018. There is plenty of free parking available, and the Centre is on the R1 bus route which runs every ten minutes from Salisbury City Centre. 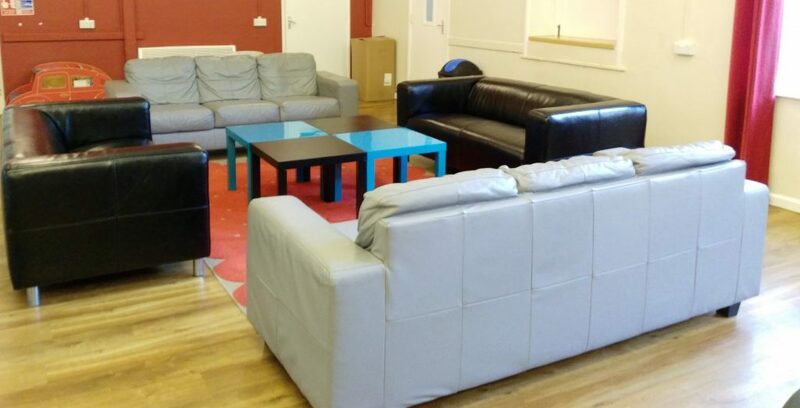 Each session starts at 10:00am and finish at 11:30am, and there’s also a lovely cafe on site where you can stay on for lunch with friends afterwards. The cost of each session is £8, with a reduced fee of £4 available for mums on low incomes. However, your first session will be half price - so come along and enjoy a song! Meeting together in comfortable surroundings with a relaxed atmosphere to learn songs together will provide an opportunity for new mums and mums-to-be to have some time for themselves and build new social support networks of their own and help reduce feelings of isolation during what should be a happy and rewarding time in their lives but is often lonely and frequently punctuated with sleepless nights and subsequent exhaustion.